The annual Collaborative Perspectives on Addiction (CPA) meeting was initiated in 2013 to provide a forum for the presentation of novel research findings and clinical practice approaches to the treatment of addiction. The CPA meeting focuses on fostering collaboration from addiction research-to-practice-to-policy. Update: Read a Welcome Message from CPA Program Chairs with helpful information on Providence, the conference venue, schedule of events, etc. The Collaborative Perspectives on Addiction (CPA) annual conference is sponsored by the Division on Addiction Psychology (50) of the American Psychological Association (APA). The meeting provides scientific programing on cutting-edge research and clinical advances across the addiction field. Attendees at all levels, will have the opportunity to connect and exchange ideas with experts in the field while attending a variety of educational and practical sessions. The 2019 CPA meeting will consist of keynote addresses, pre-conference workshops, symposium sessions, panel discussions, poster sessions, and numerous opportunities for networking during breaks, social hours, and meals. The theme for this conference focuses on addictive behaviors across diverse populations using innovative science to inform clinical practice. We recognize that the inclusion of persons from diverse backgrounds defined in the broadest sense is critically important to understanding the social and contextual factors contributing to addictive behaviors across the lifespan. The sessions at CPA 2019 will consider diversity-related factors in the etiology and treatment of addiction through presentations that include current, cutting-edge research and clinical practice. The Collaborative Perspectives on Addictions (CPA) Conference believes in the inclusion of scientists, practitioners, and learners from diverse backgrounds who have a shared interest in understanding and treating addictive disorders. We believe that this mission is enhanced by a variety of perspectives, and our goal is to create an inclusive, respectful conference environment that invites participation from people of all races, ethnicities, genders, ages, abilities, religions, and sexual orientations. We are actively seeking to increase the diversity of our attendees, speakers, and sponsors through our calls for proposals, schedule of conference events, and through dialogue with the larger communities we serve. At CPA 2019, we want every participant to feel welcome, included, and safe at the conference. We also recognize that this is an ongoing process and attendees are encouraged to speak with the program chairs regarding any concerns about diversity and inclusion at CPA 2019. We value diversity in the communities we bring together, and we welcome your contributions to bringing balanced representation of the richness of our collective conference experience. The submission portal for CPA 2019 has closed. The program for CPA 2019 will feature keynote addresses, pre-conference workshops, symposium sessions, panel discussions, poster sessions, and numerous opportunities for networking during breaks, social hours, and meals. The schedule at a glance and schedule of symposium, panel, and poster sessions is now available. We are thrilled to feature 18 symposia, 3 panel discussions, and over 160 posters during CPA 2019. We do not anticipate major changes to this schedule; however, the program committee will notify session chairs of any necessary changes. *NEW* View Poster Session Schedule with Presenter Assignments (Note: Excel file has two tabs; one sorted by presenter name and another sorted by session). Dr. Sinha is a licensed Clinical Psychologist and Clinical Neuroscientist, Chief of the Psychology Section in Psychiatry and Co-Director of Education for the Yale Center for Clinical Investigation (home of Yale's NIH supported Clinical Translational Science Award). She is the founding director of the Yale Interdisciplinary Stress Center that focuses on understanding the neurobiology of stress, trauma and resilient versus vulnerable coping mechanisms that promote neuropsychiatric diseases such as alcoholism, other substance abuse, PTSD and other chronic diseases. Her lab also develops and tests novel treatments to address these processes to prevent relapse and risk of stress-related chronic diseases. We are excited to offer three pre-conference workshops on Thursday April 4th. We have reached the maximum number of registrations for CPA 2019. The Registration Portal is now closed. Registration includes including keynotes, symposia, integrated clinical training, and posters, social hours, and receptions. Continuing education and pre-conference workshops for additional fee. Refunds/cancellations must be requested before March 1, 2019 and will incur a $50 processing fee. No refunds/cancellations after March 1, 2019. With European flair and New England charm, our landmark hotel in Providence, RI is steeped in historic character dating back to the 19th century. Step inside old-world charm and let our seasoned staff impress you with our personalized service and meticulous attention to detail. As the only AAA Four Diamond luxury boutique hotel in Providence, we are passionate about providing stellar hospitality, and our personality comes through in all we do. Located in the heart of downtown Providence's vibrant theater district, our culture and passion for the arts are reflected in everything we offer. Vintage furnishing, art, and classic novels are sprinkled throughout the hotel. Retire to your sophisticated guestroom or suite fitted with oil paintings from world-renowned artists and sleep soundly amid the city. The hotel provides hotel guests Valet parking an overnight rate of $29. Attendees not staying overnight will be charged a $16 Valet parking fee per day. Prices are subject to change without notice. Uber and Lyft pick up at TF Green and will cost around $15 to the hotel. A taxi will be closer to $40. Weekday MBTA commuter rail service is available between TF Green Airport and downtown Providence (Website: http://www.pvdairport.com/get-here/trains). The Providence train station is 0.6 miles, about a 10 minute walk from the hotel. 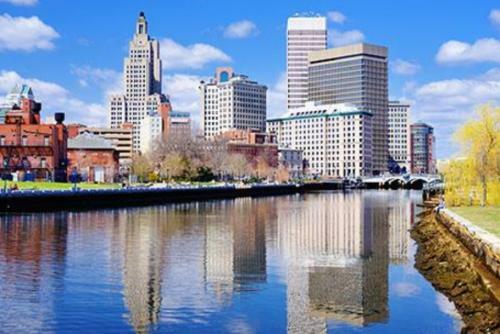 Providence is the capital city of Rhode Island, and is one of the oldest cities in the United States. It is home to Brown University and the Rhode Island School of Design (RISD), whose RISD Museum displays American art and silver. Nearby, 18th- and 19th-century homes line the streets of College Hill. Providence is located at the head of Narragansett Bay, with the Providence River running into the bay through the center of the city. The city contains the most coffee and doughnut shops per capita of any city in the country, and is also reputed to have the highest number of restaurants per capita of major U.S. cities. Providence is located about 45 minutes from both Boston and several coastal Rhode Island cities, including the beautiful and historic Newport, RI. View the 2019 CPA Sponsorship Prospectus here. For more information about sponsorship and advertising opportunities for the 2019 Collaborative Perspectives on Addiction meeting, contact Dr. Brandon Bergman at bgbergman@mgh.harvard.edu. Sponsorships can be paid via check, credit card, or paypal. If paying via credit card or paypal you can access the sponsorship payment process via the Registration Page by selecting Sponsorship Only.